At the camp established very near here Captain Clark wrote about the "butifull Breeze from the N W. this evening which would have been verry agreeable, had the Misquiters been tolerably Pacifick, but thy were rageing all night." Clark may have exaggerated when he noted that the mosquitoes were as big as house flies. They would continue to plague the explorers until winter. That evening Clark and Ruben Fields "walked on Shore with a View of examoning Som mounds." Although the mounds were probably natural features, Clark noted that the Oto Indians formerly lived there. Lewis and Clark had been trying to contact Indians who lived in the area. On July 28 one of the hunters "brought in a Missouri Indian who resides with the Otteauz, this Indian & 2 others were Hunting in the Prarie their Camp is about 4 miles off." On August 3 the explorers met with the leaders of the Oto and Missouria tribes at a site they named "Council Bluff," near present Fort Calhoun, Nebraska. 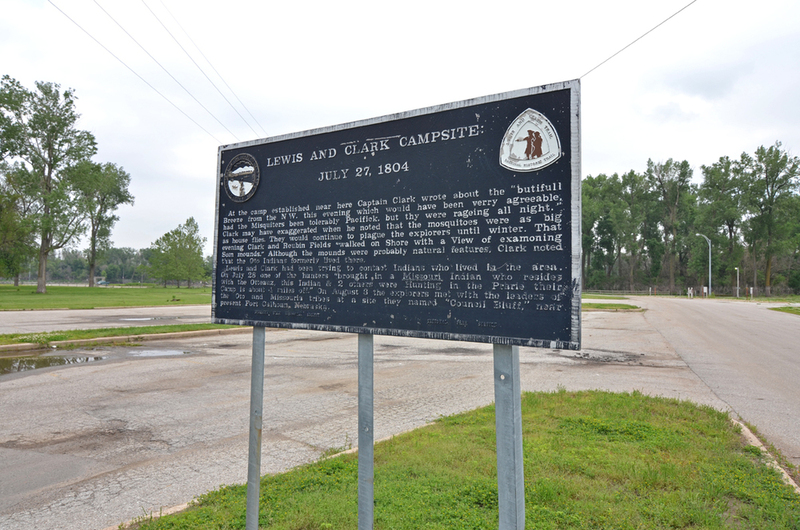 “Lewis and Clark Camp Site: July 27, 1804,” Explore Nebraska History, accessed April 19, 2019, https://mynehistory.com/items/show/190.